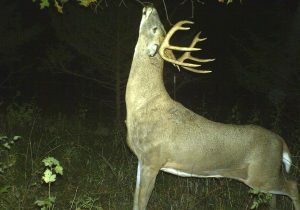 Don’t put your trail cameras away after the season! Here’s a calendar showing where your cameras should be placed throughout the year to help you learn more about the deer and increase your odds of bagging a big one next season. Once thought of as a way monitor deer movements, thus the name “trail camera,” the use of game cameras has become a sport in and of itself. Camera users have come up with all kinds of creative ways to use the cameras to monitor wildlife activity and learn more about all kinds of animals. Yet most deer hunters still bring the cameras out before the season and store them away after the hunt is over. That can be a mistake, because the more you learn about deer year-around, the better your chances of shooting one come fall. Let’s take a look at a ways to strategically place the cameras through the year. Once the hunting season is over, I move my cameras to feeding sites. The winter weather concentrates the deer in areas where there is food available. I usually have a couple sites I put out feed which allows me to get photos of the area’s deer. Otherwise, cameras can be placed on food plots and bedding areas. Trails in the snow become obvious and are easier to monitor with the cameras. Here’s another bonus to having your cameras in the woods this time of the year: You can monitor the shedding of antlers. Knowing when the bone hits the ground allows you to get out there and pick up the sheds before others get to them. I start seeing bucks without antler in numbers by the end of January, and the majority of the antlers are on the ground by the first or second week in March. This is the time of the year to put your cameras on mineral sites. Most all of the deer in the area will visit sites laced with a good mineral attractant. Some will show up regularly, some only a couple times a month, but if your cameras aren’t out there you won’t get a look at the deer. I use about five pounds of mineral per application and keep it replenished each time I check the cameras, usually about twice a month. It has worked very good for me and it really helps me inventory all the bucks in my area. By the end of August, hunting season is getting close, and I start to transition some of the cameras to trails around their feeding sites. I learn which fields they are feeding in, and placing cameras on the trails will help me patter where they are moving and what times they are coming through. This information can be invaluable when hunting season opens in a few weeks. By the first of September I have all my Covert cameras on trails related to the food sources. 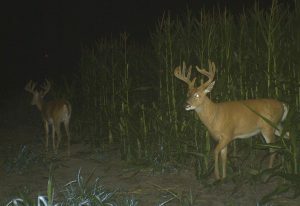 The bucks are in their bachelor groups and it’s a fun time to get lots of photos of them as their antlers become fully mature and shed their velvet the first week of September. Keep in mind that the food sources may not be the most obvious ones. The deer feeding in alfalfa and soybeans are the most visible, but there may be a lot of deer also feeding on freshly fallen acorns, hazelnuts and other mast crops. Archery season here in Minnesota opens the middle of September, and it’s hard to overstate the value of the placement of the cameras during the first half of the month. Through the second half of September and into the first half of October, the bachelor groups are breaking up and the cameras help you keep track of where the bucks are going. Trails associated with feeding patters seem to offer the best sites at this time, but by the second half of October, things will radically change. By the middle of October, scrapes and rubs are showing up throughout my hunting areas and I am moving cameras as I see the transition being made from food-focused movements to breeding focused movements. By the end of October, most all my cameras are on scrapes. I use scrape drippers to monitor the deer visits and inventory the bucks. There is no better way to get a picture of all the bucks in the area than by having a camera on a primary scrape the end of October. By the first week in November, I put my cameras on the does. To find the bucks you must find the does, you need to know where they are bedding, where they are feeding and how they are travelling between the two areas. I have my cameras in doe bedding areas and on trails between doe bedding areas and trails leading to food sources. The first three weeks of November is peak breeding time across most of the whitetail’s range in North Ame rica. The movements of bucks will seem totally random, and in a sense, they are, but they will be looking for does. One mistake many people make during this time of the year is checking the cameras too often. 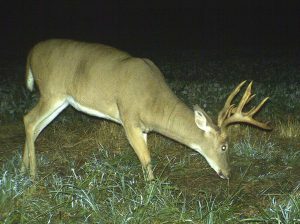 You’re seeing nice bucks every time to pull the SD cards and you really want to get back in there and look at it again. However, for best results, you want to minimize intrusion into these areas so you do not change the does’ patterns and lose the information you have gained. Resist the temptation to check the cameras until you really need the info to make an informed decision on where to hunt. By the last ten days of November, the rut is winding down. At this time you should have your cameras on pinch point and travel corridors where the bucks will be moving through, looking for the last remaining does that have not been bred. 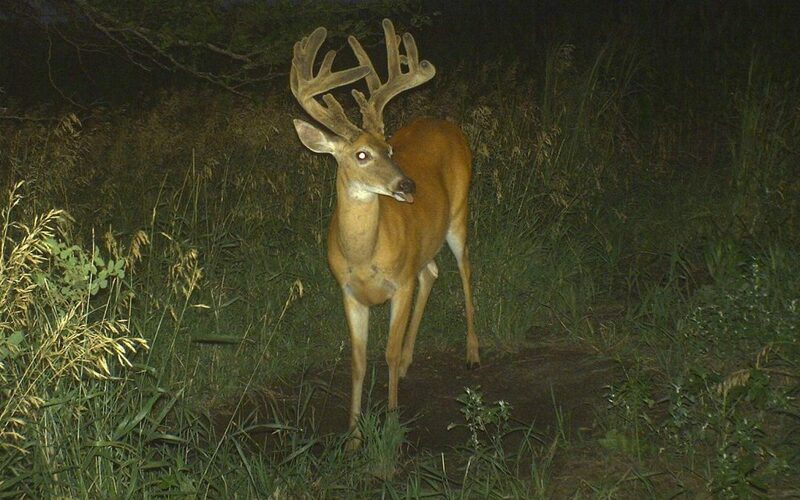 Pick places that up your odds of catching one of these bucks on their feet. The scrapes that have been ignored for the past two weeks get some more attention too. 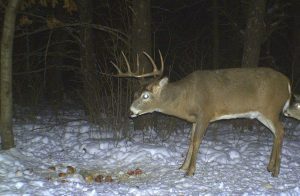 The rut is over and the focus is back on the food. Deer are looking for high-carbohydrate foods to replenish fat reserves lost during the rut. They need to combat the cold and their bodies are craving the carbs found in corn and whatever acorns may be left. Cut corn fields and standing crops are the best places to find the deer, both bucks and does. They are once again grouped up and deer of all ages and stature will be found together around the best food sources. At this time the deer will also bed in predictable places. On sunny days, they tend to choose south slopes of hills near food sources where they can soak up the solar energy. On nasty, cold or cloudy days they tend to head for the thickest cover around. Either way, they need to feed every day and the trails leading to the food sources are where you cameras should be located. This will help you learn which deer made it through the season and which did not. It will also help you fill that last minute bow tag if you are still carrying one in your pocket. So if you have put your cameras away for the year, dig them back out and get them out in the right locations. It’s great fun, great exercise and you’ll be amazed at the great information you will gather.